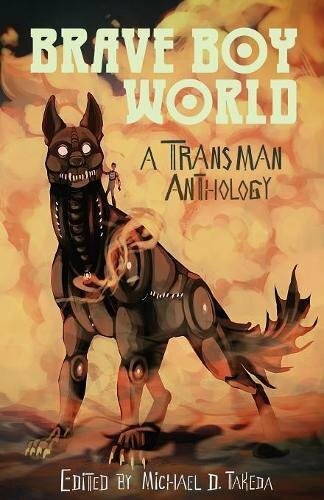 My short story, According to His Substance, is now available from Amazon.com as the lead story in Brave Boy World, an anthology from Pink Narcissus Press. The story originally appeared in my story collection, Snapshots From A Black Hole & Other Oddities. According to His Substance examines identity and our need for redemption. To what lengths would you go to to be the person you believe you are? What are the costs of redemption? Can it be achieved if you have wronged a crowd of people? And if you were given a second chance, would you have sufficient courage to try to make things right? 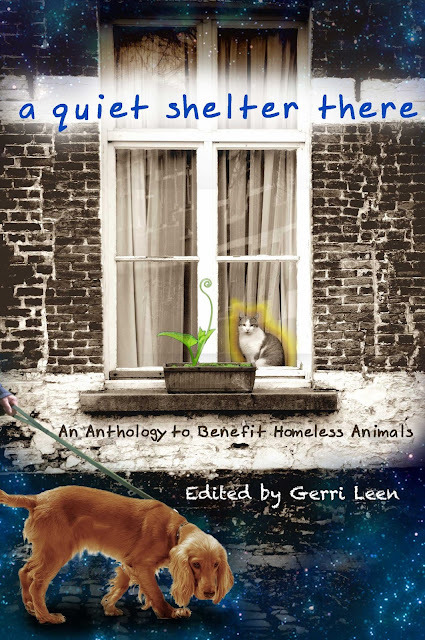 I’m rather pleased with this story and grateful to Michael Takeda, editor of the anthology, for his faith in my work. Thank you, Michael. The book looks fantastic; I am so pleased to be a part of it! And faithful readers – I hope you enjoy the story! 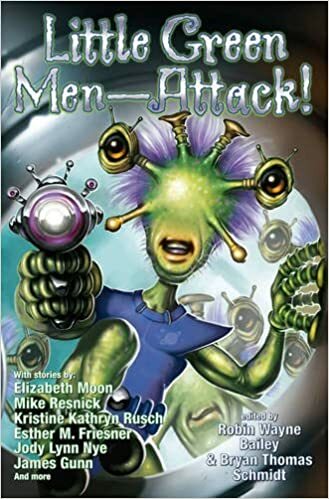 I opened today’s mail and found contributor copies of Little Green Men – Attack!, a Baen Books anthology edited by Bryan Thomas Schmidt and Robin Wayne Bailey. My story, Little Green Guys, an homage to one of my favorite story-tellers, Damon Runyon, shares the TOC with fantastic (and funny) company. The book goes on sale March 7 and can be pre-ordered now at Amazon Books. Thank you, Bryan and Robin! The whole thing looks great! And faithful readers – I hope you have fun reading all the stories! All SF writers have at least one dinosaur story. Mine is Cretaceous On Ice and it’s up now over at Perihelion Science Fiction. It’s one of my personal favorites ; an homage to a story on my top ten favorite SF list – Howard Waldrop’s Ugly Chickens, which I first read half a lifetime ago. Thanks to Sam Bellotto Jr. for accepting the story and for commissioning a great illustration by Jesse Jennings. It caught the story perfectly. And faithful readers – I hope you laugh in all the right places. 2016 was not a particularly productive year for me, as a writer. Still, it was not without it’s successes. Seventh-Hour Man, my alternate-history fantasy novel, made it’s way through an initial field of 1,500 submissions in a open call from Hodder & Stoughton, the British publishing house, and ended the process in a final field of twenty. It didn’t get a purchase offer, but I did receive a swell rejection letter. It remains unsold. As to new short fiction, I sold Last Call, a near-future sports fantasy, to Daily Science Fiction. It appeared in January 2016. I also sold Little Green Guys to Bryan Thomas Schmidt for his Little Green Men – Attack anthology, due out in March 2017, and Stay, a part of my Seattle Supernatural series of short stories, went to Pod Castle. It’s also due out in March. And Cretaceous On Ice, a personal favorite, will grace Perihelion Science Fiction on January 12, 2017. Editor Sam Bellotto Jr. has promised an illustration. I’m looking forward to that. I made some reprint sales, too. Coward’s Steel, my Writers of the Future winner, and Snapshots I Brought Back From The Black Hole, first printed in Lightspeed, both went to Great Jones Street, an I-Phone app that offers hundreds of free-to-read short stories. Both are available now to I-Phone users. And According To His Substance will appear in Brave Boy World, an anthology from Pink Narcissus Press, sometime the first half of 2017. We renewed our lease for another year, rather than go through the hassle of a move. We’re still in a studio apartment, but we’ve decided to make more use of the common areas – the kitchen, the lobby lounge, the first floor patio and the roof garden – if we have company. With that, this past Thursday and Friday we got rid of the full-sized sofa and shuffled the remaining furniture; moved the computers into what had been the bedroom and is now the office, and brought the bedroom into what had been the living room and computer alcove. We’ve also made the decision to get rid of things we haven’t touched in two years. The place already is roomier and more comfortable, with more space to come. We both are feeling tired but liberated. A great way, we think, to begin the new year. Have a happy and blessed 2017 everyone and keep up the good fight! Eight weeks since I last posted here, and it’s been a rough two months. The last two weeks of February found me in a rising panic – topped by two urgent care visits – as I found it more and more difficult to draw a breath of air. Finally landed in the hospital for three days – February 28, 29 and March 1-where I was diagnosed with pneumonia. I’ve been home six weeks and tethered to an oxygen tube for most of that time, particularly at night while I sleep. I am feeling much improved and able to move around without the extra oxygen for longer and longer spells, as long as I’m not under stress. I did well untethered the first of April, when we drove up to Skagit County for the first day of the tulip festival, so we got tickets for the Mariners home opener – one of our favorite things to do. I only made it to the fourth inning before I was panting and shivering, even though it was a pleasant night. The pressure of being in a stadium at maximum capacity (47,000+) added to my rising panic, I suppose. Rachael was gracious enough to take me home (she loves me, it seems, more than she loves the Mariners, and she does love the game). I had an oxygen tank in the car, so I was feeling better by the time we got home. No more outings for a time, it seems. Even worse, being ill has left me without the energy to write. Two months and I haven’t done a thing but sit and stare at the monitor. Some improvement there, though. I wrote this post today and last night I managed to add two hundred words to Still and Always Incandescent, a post-apocalyptic tale involving the Geezers of Fury, a septuagenarian motorcycle club. Hopefully, I’ll have more to tell about that project soon. Life at a gallop ..
For the past couple weeks, I’ve been mulling over how quickly time passes and how we all float in and out of other people’s lives. I grew up in small-town Ohio with a fellow named Mike Kuntz. There was a group of us who were pals, the same age, and we all called him Kuntzie. We were the smart kids in our class, the ones the teachers called on first because our hands were always in the air. Summers, we swam the pools that collected in the northeast Ohio strip-mines; played marathon Monopoly and Risk games on Tom Dreher’s porch and blew up plastic model cars with M-80s and other firecrackers that are illegal now. Winters, we would hang around somebody’s house and spin dreams about what we would do when we got out of high school. For most of us, that meant getting out of town. First to college and then to other things more exciting than could be done in little Ohio towns. We promised to stay in touch, but you know how things are. Life comes at you at a gallop, and you either swing on board and hold on tight or get trampled in the rush. From time to time, I heard he was hanging out somewhere in Europe or Australia or New Zealand. It sounded like he was having fun, but that Sunday morning breakfast was the last time I ever saw or spoke to Kuntzie. That was forty years ago. If I even took or had the time to think of Mike in the intervening years, it was to daydream for a few minutes of all the exotic places he had been. Last week, my sister sent me an e-mail to tell me he had died suddenly. He had stopped roaming a quarter century ago, found a job as a government geologist, got married and raised two kids. Along the way, he had the time to run marathons and iron-man triathlons; finished as high as second in his age group in one race. And for the past nine years, since we moved to Seattle from the Florida Keys, I’ve lived forty-five minutes away from where Kuntzie had settled down. In the Pacific Northwest, that’s practically next door and I never knew he was there. Life can be many things, some wonderful and some not, but first and most of all it is ironic. I finished Ann Leckie’s Ancillary Mercy tonight. It’s the third in a trilogy – Ancillary Justice, Ancillary Sword and Ancillary Mercy. I’ve read all three. The trilogy follows Breq, the sole survivor of a starship destroyed by treachery and a human clone that is the vessel of the starship’s artificial consciousness, as she attempts to revenge herself on the ruler of her civilization. Leckie explores what makes an individual human and defies our society’s binary gender paradigm by using the feminine pronoun for all characters and refusing to use character descriptions that might, in any way, suggest sexual identity. That is jarring, at first, but I soon fell into the notion and found it comfortable. The three books also suggest that the only way to earn loyalty is by giving loyalty, of which I very much agree. Ancillary Justice, published in 2013, won the Hugo Award, Nebula Award, British Science Fiction Association Award, Arthur C. Clarke Award and Locus Award. It is one of the few novels to sweep those awards and is, in my opinion, the best of the three books by far. All the awards were well deserved. Read them to finish up Breq’s tale, but don’t expect any of the surprises of the first book. So to the editor who sent this, I tip my glass of cranberry juice in an early-morning toast. Thank you! Your kind words have made my day. I just finished reading The Bazaar of Bad Dreams, Stephen King’s new collection. A King fan since I read Carrie, I am sorry to say the short stories in this book are not up to King’s best work. None of the stories are truly awful, but none are memorable, either; except for the last story – Summer Thunder. It’s a melancholy piece about the end of the world; somewhat reminiscent of the early pages of The Stand, but with a tighter focus. Stuart Redman and Glen Bateman come to mind, as King relates the last few days of two men and a dog, and although the ending is expected it still carries quite a punch. Just before King, I read George R.R. Martin’s A Knight of the Seven Kingdoms. Although it’s novel length, it’s really a collection of three connected novellas set in Westeros two hundred years before the Starks and Lannisters and Baratheons went at it, toe to toe. I was drawn into the lives of Ser Duncan the Tall, a hedge knight who is far too honest and noble for his own good, and his squire, Egg, who is really a prince-to-be, Aegon Targaryen. Although the stories were previously published in 1998, 2003 and 2010, I had never read them. The first one, The Sworn Sword, is the best, but I enjoyed all three tales. If you’re a fan of Martin, the book is well worth the read.